The warm welcome from Donald and Muriel Lohnes at their Pandora's Box on the comer of Allen and Cooley Sts., Springfield, defies the story of Greek mythology. The combination floral and gift shop offers the sweet fragrance of flowers and your eyes are opened to a variety of gifts rather than the ills of man. Bro. Lohnes is a busier man than usual this year. He is Illustrious Potentate of Melha Temple in the city where he was born in 1932. Now a resident of Wilbraham, he was Raised in Belcher Lodge, Chicopee Falls, in 1955 and served as Master in 1963-64. He holds Honorary Membership in every Lodge of the Springfield 33rd District of which he was once District Deputy. A member of the York and Scottish Rite Bodies, he is a Thirty-third Degree Mason, Grand Lecturer, and member of the Education Committee of Grand Lodge. 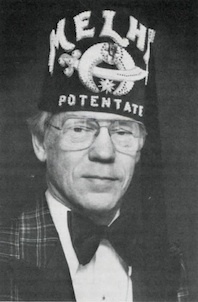 The Deputy Grand Master in 1977, R. W. Lohnes is Grand Representative to the Grand Orient of Italy, Trustee of the DeMolay Foundation, and Honorary Legion of Honor. With a national budget of 132 million dollars to operate 19 orthopedic hospitals and three burns centers in America, R.W. Lohnes has to make sure Melha Temple remains a vibrant organization in order to gain its share of the funds. Shrinedom has also budgeted 32 million dollars for capital expenses and another 11 million for research, all pointed toward helping children under age 18 at no cost to their families. This memorial was provided by Rt. Wor. Bro. Lohnes' brother, Leslie Lohnes. Brother Lohnes was born in Springfield, Massachusetts on February 22, 1932, a twin son of Arnold F. Lohnes and Anne W. (Trimble) Lohnes. He was educated in the Springfield Public Schools where he graduated from Technical High School. He continued his training in the printing and graphic arts industry while employed by two local printing companies. In 1960, he assumed the position of Production Manager for the former General Offset Printing Company in Springfield, where he served in that capacity until 1980 when he made a career change and opened a flower and gift business known as "Pandora's Box'" in Wilbraham and Springfield. He operated that shop for ten (10) years before health issues led him to relocate to the warmer Florida climate where he re-entered the printing business combining his vast technical skill and marketing experience. On September 22, 1962, Don married his long time family friend and sweetheart, Muriel Jean Donnelly, in Chicopee, Massachusetts. Muriel, throughout their thirty-seven (37) year marriage, was not only a loving spouse, but one of Don's chief supporters in all of his activities, including business, social and, most of all, Masonic. In his youthful years, Don's hobbies and sports activities included roller skating, boating, and water skiing. He, his twin brother, Ron, and other family members, spent practically every summer weekend enjoying Don's speed boat at area lakes, and occasionally off the Connecticut and Rhode Island shore. Brother Lohnes was previously an active member of First Central Baptist Church in Chicopee, Massachusetts where he was involved with youth activities and later served as Head Usher for many years. "Don Lohnes was my friend. Each Sunday after the worship service was over and I walked down the aisle of the church, Don was always waiting at the end of the aisle to greet me and, even more important, to hug me. There was in his eyes the light of joy and acceptance. There was in his voice the encouragement of a friend. And there was in his embrace the warm, loving presence of God. Don embodied the love of God in Jesus Christ - an unselfish, sacrificial kind of love. He had a way of making everyone feel welcome and comfortable wherever he was...."
Brother Lohnes was most recently the Chairman of the Board of Governors of the Westminster Manor Nursing Home in Fort Lauderdale, Florida. Don was always very close to his family. As one of five (5) children, he leaves his wife, Muriel; mother, Anne; a sister, Beverly Proulx; and three (3) brothers. Right Worshipful Arnold Lohnes, a Past Grand Lecturer in Illinois, Worshipful Ronald Lohnes, his twin, and Right Worshipful Leslie Lohnes, who refers to his brother Don as much more than a brother. He was an inspiration, mentor, and most of all, a friend. Right Worshipful Brother Lohnes' Masonic record is indeed impressive. He, along with his father and twin brother, were raised together in Belcher Lodge, A. F. & A. M., on November 29, 1955. He served as Worshipful Master of Belcher Lodge, now known as Elm-Belcher Lodge, in 1964. His service to our Grand Lodge began with his appointment as Senior Grand Steward in 1970. He was Master of the 5th Lodge of Instruction from 1971 to 1973, and was appointed District Deputy Grand Master of the Springfield Thirty-third Masonic District for 1975 and 1976. Right Worshipful Brother Don's sincere dedication, enthusiasm, and pure masonic qualities led Most Worshipful Stanley Fielding Maxwell to appoint him Deputy Grand Master on December 27, 1976. Brother Lohnes served as a member of the Grand Lodge Committee on Education, was appointed a Grand Lecturer for our Grand Lodge in 1980, and has been our Grand Representative from the Grand Lodge of Italy, Grand Orient from 1977, in which year he also received the Henry Price medal from our Grand Lodge. He was a former Trustee of the DeMolay Foundation of Massachusetts, and a member of Massachusetts Court DeMolay Legion of Honor. He enjoyed many active years of membership in the Past District Deputy Grand Masters Association and the Past Deputy Grand Masters Association of Massachusetts. He was a member of York Rite, being received in Unity Chapter Royal Arch Masons on April 17, 1965, greeted in Springfield Council, Royal and Select Masters on August 9, 1975, and was knighted in Springfield Commandery No. 6 on April 30, 1977. He held membership in Saint Matthew's Conclave Red Cross of Constantine, and wa& Puissant Sovereign in 1988. Brother Lohnes was a member of all Scottish Rite Bodies in the Valley of Springfield, having joined in the Spring Class of 1970. He served as Thrice Potent Master of Evening Star Lodge of Perfection in 1978 and 1979. Other masonic memberships and activities included: Colonial Council Knight Masons; Royal Order of Scotland; Massachusetts College Societas Rosicruciana; and the Royal Order of Jesters, Springfield Court #144. He was created a Sovereign Grand Inspector General; 33rd Degree; Honorary Member of the Supreme Council; Ancient Accepted Scottish Rite of the United States of America; Northern Masonic Jurisdiction on September 25, 1985 in Detroit, Michigan. Right Worshipful Brother Lohnes was a long time active Shriner as a member of Melha Temple, A.A.O.N.M.S., of Springfield, Massachusetts. He held memberships in the Hadji (Mini Scooters), Past Masters, and Highlander Units as well as the Old Timers, Westfield Valley, Hampshire Valley, Franklin Valley, Pioneer Valley, Berkshire Valley, and Boca Raton Shrine Clubs. 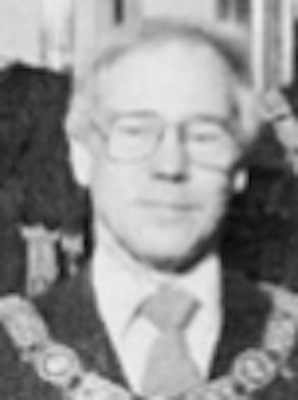 In 1977, he served Melha Temple as Masonic Relations Officer and was appointed to the Divan as Captain of the Guard in 1979, progressing to Illustrious Potentate in 1986. Rest well my brother, you have truly earned that right and privilege given only by Him who guides our fate. LAKE WORTH, Ha. - Donald J. Lohnes, 67, of Blue Bay Circle, and formerly of Wilbraharn, Mass. died Friday at Baystate Medical Center, Springfield, Mass. He was a production manager for the former General Offset Co. of Springfield, and also worked in the printing industry in Florida until his death. Born in Springfield, he was longtime resident of Wilbraharn until moving to Florida 10 years ago. He was a graduate of Springfield Technical High School. He was a member of First Presbyterian Church, Fort Lauderdale, where he served as head usher and on the board of trustees, and was a trustee and chairman of the board of Westminister Manor Nursing Home. He was a member of First Central Baptist Church of Chicopee, Mass., a member and past master of Elm Belcher Lodge of Masons, West Springfield. Mass., and a member and past master of Newton Lodge of Wilbraharn. He was past district deputy from 1975-1976. past deputy grand master, past grand lecturer of the Grand Lodge of Massachusetts and a 33rd degree Mason. He was also a member of all York and Scottish Rite Bodies, the Royal Order of Scotland Red Cross of Con-stantine, of Melha Temple Shrine where he served as Potentate in 1986, the Melha Hadji mini scooter unit, the past masters unit, the Royal Order of Jesters and the Boca Raton Shrine Club. He was the recipient of the Demolay Legion of Honor Degree. He leaves his wife, the former Muriel Donnelly; his mother, Anne (Trimble) Lohnes of Wilbraharn; three brothers, Arnold J. of Las Vegas. Nev., his twin. Ronald E. of West Springfield and Leslie P. of Wilbraharn; and a sister. Beverly A. Proulx of Winston-Salem, N.C. The funeral will be Wednesday morning at Byron's Allen Street Funeral Home. Springfield, with burial in Fairview Cemetery, Chicopee. Calling hours are Monday evening and Tuesday afternoon and evening. I stand before you tonight with a very deep feeling of humility and it is with that feeling that I have accepted the honor given me today. I thank you, Most Worshipful Sir, for the trust and confidence that you have placed in me and I promise you and this Grand Lodge that I will serve this office to the very best of my ability. For the past 21 years Masonry has been a very important part of my life and I look forward to this next year to serve Masonry and my Brethren in this capacity. As each one of us journeys through life we are constantly reminded of our duty and responsibility towards each other, as Masons to live and serve each other, to practice the tenets of our institution in our everyday lives, to live by the principles laid down in that great light in Freemasonry, the Holy Bible. As each one of us travels through our daily lives and practices the lessons that we have learned in that great Book, our Masonry, our Lodges, our Churches and our community will continue to grow and prosper. I like the slogan that our Grand Master has just come up with for next year, "Thank you, Freemasonry". I think that each one of us here has a great deal to thank Freemasonry for, for through Freemasonry we have all learned how to live and what life is all about. Now, Most Worshipful Sir, I speak on behalf of all your appointed Officers. We thank you for the opportunity and the privilege to serve you and to serve our Grand Lodge in the year ahead. We pledge ourselves to serve to the very best of our ability, to continue to practice the ideals and principles of Masonry in our everyday lives. To those of us who have been privileged to know you, we have a great love and respect for you as a man, a Mason and as a leader. We look forward to a great year with you and are proud and happy to be a part of your team for 1977. For all of my Brethren, 1 wish for each one of you a happy, healthy and prosperous New Year, and may the Giver of all that is true and just, give unto each one of you faith, hope and trust, the wisdom to know and the work to do, and friends who will love you your whole life through. May the Giver of gifts give this to you. I thank you, my Brethren. This page was last modified on 16 September 2016, at 14:05.